The guys at Volcano Cafe have picked up where they left off with a rather interesting choice at number 5. Mexico is one of the more volcanically active countries in the world, with the likes of Popocatépetl and Colima frequently showing at least some signs of unrest. This has been one of my favourites which they have put forward as it highlights the complexity of the region and how several systems can affect a region meaning threat can come from varying or even all sources! It is inevitable that the higher we get in this series, the more speculative our choices may seem. If everything was known about every volcano, identifying and motivating the choice of the ten most dangerous ones would be a relatively simple matter. As it is, our selections have to be based on what meagre information is available and educated guesswork as to what the full story might or could be. In our choice of number five, this is highlighted as we cannot even identify a single volcanic system as the main threat, but then the area occupied by the cities Mexico City, Toluca and Puebla is highly unusual. Throughout almost its entire length, the Ring of Fire produces volcanoes aligned on and along the subduction zone forming a great arc of stratovolcanoes which has given rise to the term “Arc Volcanism”. But running across Mexico from Colima in the west to Pico de Orizaba in the east, the subduction zone makes an almost 90-degree turn and the volcanoes seem to align on a N-S line, perpendicular to the subducting plate. 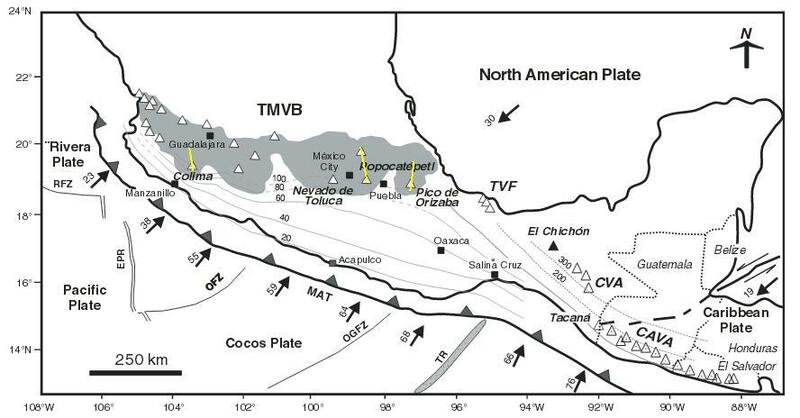 Three main such alignments are identified in recent scientific papers; Cántaro–Nevado de Colima–Colima de Fuego in the west, Tláloc–Telapón–Iztaccíhuatl–Popocatépetl (Sierra de Nevada) just east of Mexico City, and Cofre de Perote–Las Cumbres–Pico de Orizaba–Sierra Negra at the eastern end of the Trans Mexico Volcanic Belt, alternately known as the Trans Mexico Volcanic Zone. For the entire TMVB, volcanism has trended from acidic (dacite and rhyolite) to intermediate magmas (andesitic) as well as from north to south although there are numerous and noticeable exceptions to these identified trends. In addition to these three main lines of active volcanism, there are further lines of dormant or extinct volcanoes, one bordering the Mexico City plain to the west and the Toluca plain to the east with another one bordering the latter plain to the west. To complicate the matter even further, both north and south of these plains run lines of ancient, heavily eroded and extinct(?) volcanic edifices that seem to follow the subduction zone. If we also include the Puebla plain to the east of the Sierra de Nevado, there are more than 1.6 million inhabitants of Greater Toluca, 22.5 million of Greater Mexico City and 2.1 million of Greater Puebla, in all well in excess of 25 million. As of 1999, there were seven calderas known in the belt, one of which is in fact no more than a crater lake, Lake Alchichica, with a diameter of 1888 meters. The largest of these seven calderas is the 15 by 21 km Los Humeros caldera in the state of Puebla, close to its border with Veracruz. It lies 55 km west-north-west of the city of Veracruz (Xalapa), relatively close to Puebla (Teziutlán). The main caldera is about 400 m deep and roughly oval in shape. Prior to its formation 460,000 years ago, lava emitted from this vent covered 3500 square km with ignimbrites. Later, two smaller calderas formed nearby, with ages of about 100,000 years (Los Potreros caldera) and 30,000 years (El Xalapazco) respectively. The 11 km wide and 400 m deep, heavily eroded Amealco caldera is located at Garabato (= unintelligible scribbles), midway between the towns of San Juan del Río and Maravatio, about 125 km NW of mexico City. Caldera-related activity started in the Pliocene ca. 4.7 Ma ago and ended around ca. 2.2 Ma. The total volume of pyroclastic flow deposits and ignimbrites is in the region of 500 cubic km. The Huichapan Caldera in the central sector of the TMVB, also referred to as the Donguinyó-Huichapan caldera complex is 10 km in diameter and appears to be the result of two overlapping calderas that date to 5 and 4.2 million years ago respectively. The rocks from the older caldera are intermediate to basic in composition, while those from the more recent caldera are acidic (high silica content) rhyolites, another relatively unusual feature. 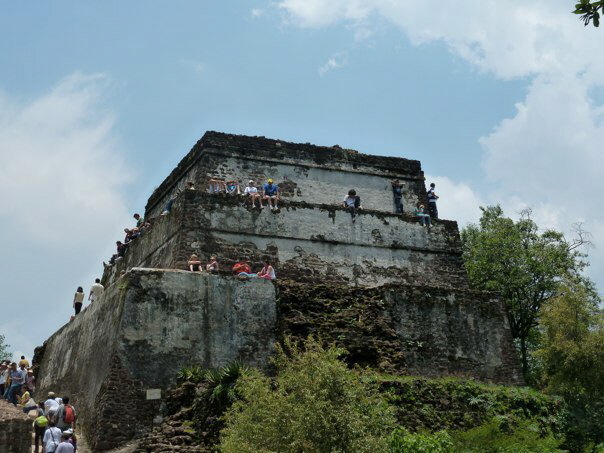 Since then, one very interesting albeit ancient feature has been discovered in the Coxcatlán-Tilzapotla region, about 100 km south of Mexico City, just south of the TMVB. The elliptical NW-SE oriented dome structure, approximately 30 x 52 km, encompasses the Tilzapotla collapse caldera, rhyolitic domes, large volumes of ignimbrites, as well as the Buenavista intrusive body, and the Coxcatlán and Chautle plutons located west and east of the structural margin of the caldera, respectively. Previous geochronological studies carried out on the silicic and intermediate magmatic rocks places the uplift in the dome area in the late Eocene (~38-34 Ma). This suggests that doming was related to emplacement of magmas into the crust prior to collapse of the Tilzapotla caldera at 34.3 Ma. 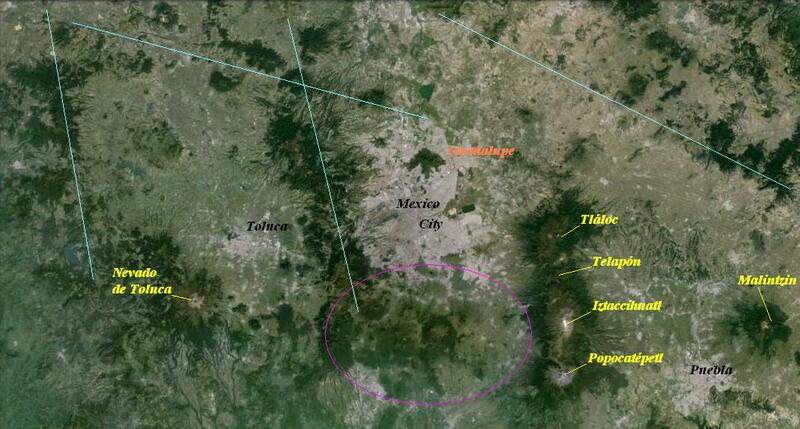 The approximately 11 x 13 km Tilzapotla caldera is located on top of this large, rhyolitic dome feature. “The caldera is defined by a 33 x 24 km semi-elliptical structure that encircles the largest exposures of the Tilzapotla ignimbrite and corresponds to the structural margin rather than the topographic rim. A central uplifted block limited by NW-trending faults is the main indication of a resurgent stage. The caldera structural margin is surrounded by extensive exposures of Cretaceous marine sequences that structurally define a broad elliptical dome (45×35 km) originated in the first stage of the caldera evolution. There is evidence showing that the 34 Ma Tilzapotla ignimbrite represents the climatic event of the caldera collapse.” (Morán-Zenteno et al 1998) This begs the question of how the very large dome feature itself was formed. It covers some 1500 square kilometres to a height more than 1,000 m above the surrounding plains with a total thickness in excess of 800 m. If we make allowances for surface depression and 34 My of erosion, the total volume emitted is in excess of 1,500 cubic kilometres of silicic magma. The observed absence in the TMVB of the elsewhere omnipresent large explosive calderas is a conundrum. Either they have been masked by the products of subsequent volcanic eruptions and rapid, tropical erosion and still await discovery, or, volcanism in the TMVB is sufficiently different to almost preclude these eruptions. However, the presence of the >500 km3 Amealco caldera, the 15 by 21 km Los Humeros caldera and the 10 km Huichapan Caldera rather points to the former being the case. In order to gain an insight into how very complex Mexican volcanism can be to unravel, at this point I recommend a look at the reconstruction by Diaz & McDowell (page 11); “Figure 7. Volcanic evolution of the Amealco caldera and peripheral volcanoes”. It is unfortunately too large to reproduce here, so please, take a look! In the Nahuatl language, “Xinantécatl” means “naked man”. Alternately, the name has been interpretated as “Chicnauhtécatl”, “nine hills” which given the volcano’s appearance seems the likelier. Nevado de Toluca is a composite volcano of late Pleistocene-Holocene age with a calc-alkaline andesitic to dacitic composition. The northern flank of Nevado de Toluca has a relative elevation (prominence) of 2015 m with respect to the Lerma river basin, and its southern flank has a relative elevation of 2900 m with respect to the Ixtapan de la Sal village. The elliptical 1.5 by 2 km wide crater of Nevado de Toluca is breached to the east. The interior holds a dacitic central dome and the remains of two ancient scars, located on the SE and NE flanks of the volcano which are related to the partial collapse of the edifice. Unusually for volcanic lakes, the two crater lakes are alkaline, not acidic. Nevado de Toluca was built upon the intersection of three fault systems with NW-SE, NE-SW, and E-W orientations. This structural geometry favoured the formation of coalescent pyroclastic fans that reach all the way to the cities of Toluca and Metepec, 25 km to the NE of the volcano. 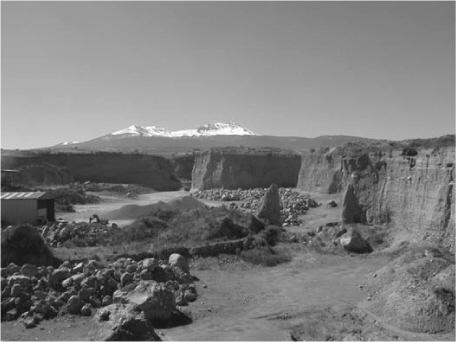 During the late Pleistocene, the southern flank of Nevado de Toluca collapsed twice, originating debris avalanche deposits that were transformed into debris flows with distance. The scars produced by these collapses have disappeared due to subsequent volcanic activity and glacial erosion. The older flow can be traced to distances up to 35 km from the summit while the younger event near the end of the Pleistocene ( > 40 kA) generated a debris avalanche, the “Pilcaya Debris Flow”, that travelled more than 55 km from the summit. Activity then continued with three very large explosive eruptions – the Lower Toluca Pumice ca. 21,700 yr B.P., the Middle Toluca Pumice ca. 12,100 yr B.P. and the Upper Toluca Pumice ca. 10,500 yr B.P. The pyroclastic deposits of these eruptions are mostly covered by subsequent and “smaller” Plinian eruptions. From north to south, the Sierra Nevada Volcanic Range comprises the volcanoes Tláloc, Telapón, Iztaccíhuatl, and Popocatépetl. Previously, it was considered that volcanic activity began to the north and migrated south but new evidence obtained from previous studies, field reconnaissance and radiometric dating paints a slightly different picture. During the past 10,000 years, there have been repetitive Plinian eruptions of Popocatépetl including some historic events and the 1994–present eruption, but Holocene activity has not been limited to Popocatepetl alone. 9,000 years ago, Iztaccíhuatl produced the Buenavista dacitic lava flow. As is obvious, magmatism of the Sierra Nevada Volcanic Range has not kept a continuous north to south migrating path as had been previously surmised. Rather, it has shifted back and forth chaotically throughout its evolution. Volcanism at the Sierra Nevada Volcanic Range likely started 1.8–1.4 Ma years ago with the construction of Paleo-Tláloc volcano, today buried by younger deposits. The activity continued between 1.07 and 0.89 Ma with the emplacement of dacitic domes, lavas and associated pyroclastic flows (“San Francisco” 1 Ma, “Chicoloapan” 0.9 Ma). Then between 0.94–0.84 Ma, the main edifice of modern Tláloc was built up through the emission of dacitic lava flows. Although Popocatépetl took over as the centre of eruptive activity about 320 kA, Tlaloc reawakened with the emission of rhyolitic magma at 129 kA followed by the emplacement of the El Papayo dacite (118 kA) to the south and Téyotl summit lavas (80 kA). The inauspicious 260 m high (elevation 3,600 m) steep-sided Cerro Papayo dacitic lava dome marks the vent of the Telapón volcano on the north flank of Iztaccíhuatl formed approximately between 0.38 Ma and 0.34 Ma ago with the emplacement of lava flows and a dome. The 21 cu km compound lava field covers 84 sq km and includes flows that travelled long distances in opposite directions – into the Valley of Mexico and towards the Puebla basin. In addition, the Papayo lavas overlie glacial moraines about 12,000 years old, thus Telapón has been active until the very end of the Pleistocene. The lithology of Telapón shows two periods of activity. First, an andesitic-dacitic Lower Volcanic Event that was emplaced between 1.03 MA and 65 kA, and second, a dacitic-rhyolitic Upper Volcanic Event emplaced between 65 to 35 kA. (Macías 2007). 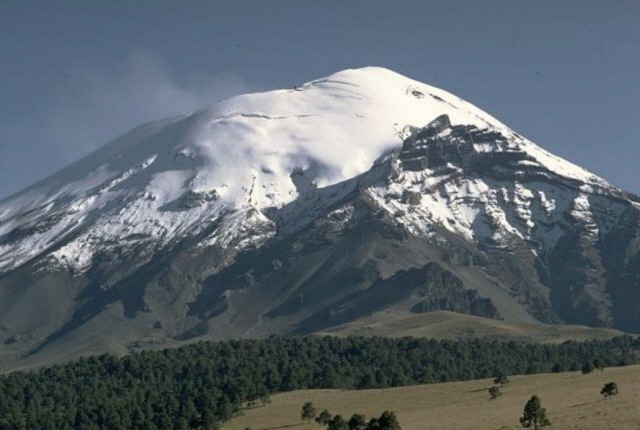 The name “Iztaccíhuatl” means “White woman” in the Nahuatl language. Linked to the Popocatepetl volcano to the south by the high saddle known as the Paso de Cortés, it is a 5,230 m (1,560 m prominence) dormant volcanic mountain. Despite its relatively modest prominence, the volume is a staggering 450 km3, which is 100 km3 greater than that of Mount Shasta, Oregon. 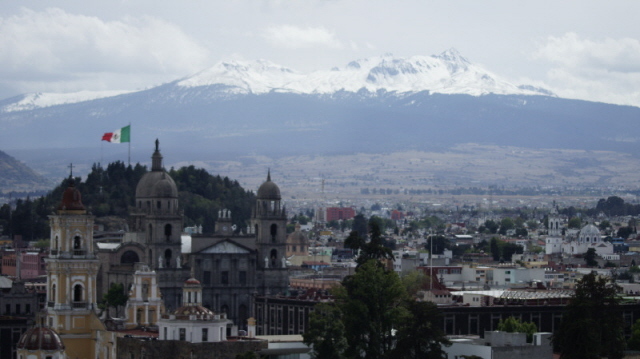 Iztaccíhuatl began its activity ca. 1.1 Ma ago. From then until 0.45 Ma several volcanic edifices were formed. 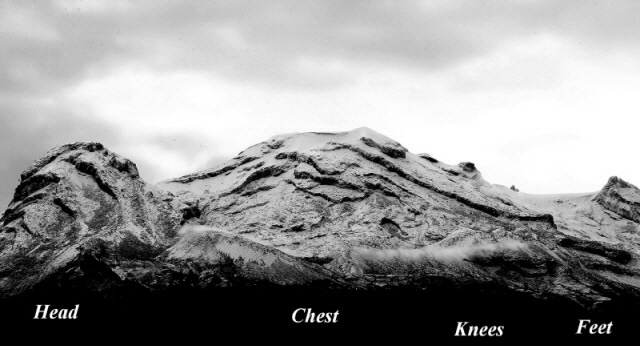 At that date, the Los Pies Recientes cone was devastated by a Mount St. Helens–type event which destroyed the southeastern flank and produced a massive debris avalanche accompanied by large pyroclastic flows. Popocatépetl is the most active volcano in Mexico, having had more than 15 major eruptions since the arrival of the Spanish in 1519 with the most recent in 1947. In Nahuatl, the name means “Smoking Mountain”. Popocatépetl reaches 5,426 m a.s.l. with a prominence of 3,020 m with a base diameter of about 25 km. The crater is elliptical with an orientation northeast-southwest. The walls of the crater vary in height from 600 to 840 m. It lies 70 km southeast of Mexico City and more than one million people live within a radius of 40 km from the summit. 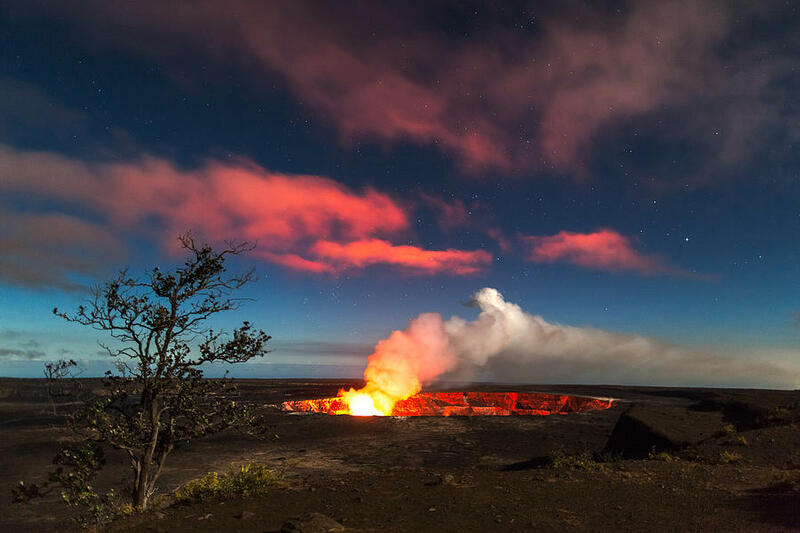 According to paleomagnetic studies, the volcano is about 730,000 years old. Popocatépetl used to be covered by glaciers, but due to increased volcanic activity in the 1990s, the glaciers covering Popocatépetl greatly decreased in size and by 2001 they were gone. Historically, Popocatépetl has erupted predominantly andesitic magma but it has also erupted large volumes of dacite. Magma produced in the current cycle of activity tends to be a mixture of the two. There are at least four debris avalanche deposits around Popocatépetl volcano. The oldest comes from the failure of the SE flank of Iztaccíhuatl volcano, and the other three come from the flank collapse of paleo-Popocatépetl, the youngest being the 23,000 yr B.P. deposit. The modern volcano was constructed to the south of the late-Pleistocene to Holocene El Fraile cone. Three major Plinian eruptions, the most recent of which took place about 800 AD, have occurred from Popocatépetl since the mid Holocene, accompanied by pyroclastic flows and voluminous lahars that swept through the basins below the volcano. During the past 20,000 yr the explosive activity of Popocatépetl has been characterized by four major events (14,000, 5000, 2150, and 1100 BP) and four minor events (11,000, 9000, 7000 and 1800 BP) The events that occurred at 5000 and 1100 BP had a similar evolution. They began with hydromagmatic explosions that dispersed wet pyroclastic surges up to 20 km from the summit. These explosions opened the magmatic conduit, decompressed the magmatic system, and formed >25-km-high Plinian column. From our perspective, it is of interest to note that the last three Plinian eruptions of Popocatépetl coincide with three important events in Mesoamerican history: The 3195–2830 B.C. eruption coincides with the 3114 BC beginning of the Mesoamerican Calendar. The 215 BC eruption coincides with the transition from the Preclassic to the Classic period. The last major eruption, which probably occurred in 823 AD, coincides with the Classic-Postclassic periods transition. The Chichinautzin volcanic field contains more than 220 Pleistocene to Holocene monogenetic vents and covers a 90-km-long, E-W-trending area immediately south of Mexico City. It is formed primarily of overlapping small cinder cones and shield volcanoes with a mainly basaltic-andesitic to andesitic composition with a thrachytic component as well as some dacite evident. The highest peak of the Sierra Chichinautzin is the Volcán Ajusco lava-dome complex at 3930 m a.s.l. There have been at least eight eruptions within the past 10,000 years with the most recent about 1670 radiocarbon years ago (~340 AD) from the Xitle scoria cone. These eruptions have typically been VEI 3 with one registered as a VEI 4. A very modest estimate based on an oval 60 x 90 km with an average emplaced height of 250 m yields a figure of 1,050 cubic km for the volume of the dome but the true figure could be more than double that. From the list of sources in the GVP entry for the Chichinautzin volcanic field, it would seem that some individual cones, vents and flows have been studied, but not the feature as a whole. What is it? What is its true age? Why is it so large, far larger than the initial shield deposited during the first development stage before volcanism shifts to construct (a series of) stratovolcanic edifices? Is there a significance to its position on the same isoline above the subduction zone as Pico de Orizaba, Popocatépetl and Nevado de Toluca? The geological setting of the Mexico City basin is unusual in that the subduction zone makes an almost 90-degree angle and that the major volcanoes do not follow the subduction zone but rather form lines at right angles to it. Instead of showing a neat progression, volcanic activity has been shown to jump “chaotically” (Macías 2011) both geographically as well as petrologically. There is a marked absence of identified caldera structures in the area, yet in the middle of it, right at the southern edge of the city limits, lies a more than 1,000 km3 large Pleistocene to Holocene dome structure that has been active until recently, one that is not well studied. In addition to this, the Nevado de Toluca volcano has already produced eruptions sufficiently large to deposit ignimbrites at distances greater than 25 km from its summit and Popocatépetl clearly has the potential to do so. Both these volcanoes (and Iztaccihuatl) have suffered several major edifice collapses where deposits have been traced to distances greater than 55 and 70 km respectively. 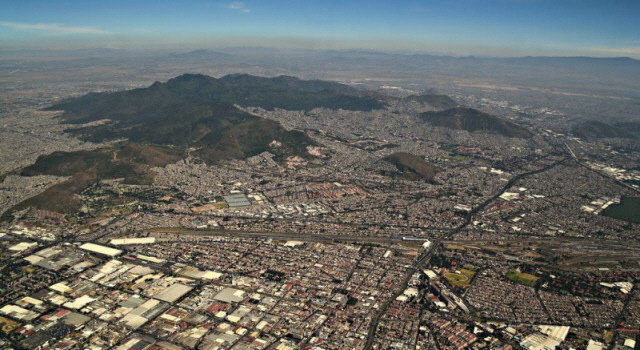 With almost 30 million people living within 100 km, Mexico City will remain on our list until the mysteries of why the “currently and recently active” volcanoes of the TMVB align perpendicular to the subduction zone as well as where and why the very large, caldera-forming eruptions (VEI 6 to 7) have disappeared to have been unravelled. It will remain on our list until we have a thorough investigation of the past and likely future evolution of the gigantic Chichinautzin volcanic field as well as a better understanding of the risks posed by the large stratovolcanoes in the vicinity. The more I delved into this subject, the more intricate it became and the more I realised just how little I understood. The TMVB as it passes the Toluca – Mexico City – Puebla area once fully investigated may well deserve a place higher up on the list (or possibly even be struck from it), but with the material and understanding at present, we will leave it at a provisional fifth place on our list. I may have bee quiet on eruption updates lately but that is far from meaning our restless Earth has been quiet. Here is some of the recent updates. As Kilauea has been in a constant state of eruption since 1983, some don’t consider changes in activity as news. However as the June 27th lava showed us this relatively calm giant still poses a threat to people. USGS reports suggest that the summit is still inflating; 7.5 microradians were recorded in the past week alone. Over the weekend we saw rapid filling of the Halema’uma’u crater from a depth of 90 ft from the crater rim to within 10 ft by Sunday lunch time. Yesterday (April 29th) the webcam observed small explosions and spattering with rock falls as the crater began to overflow. Seismicity remains at an increased level towards the summit and East rift zone where wide spread breakouts from the eruption site are active as close as 8 km of Pu’u ‘O’o. There has be net inflation of Pu’u ‘O’o over the past week but not as significant as at the summit. As the June 27th Lava flows nears its 1 year anniversary incandesance indicates that surface flows remain active northeast of Pu’u ‘O’o. Although the more explosive phase of the eruption seems to have died down, there are still high ash emissions and flight disruption is still an issue across both Chile and Argintina with ash plumes trailing to the north and south east at just over 1.5 km high. The 20 km exclusion zone is still inplace however it is belived that some people have returned to their homes within the area with maximum displaced 6,514 at the begining of this week. Seismicity has since declinded but it is still under observation. Collapse of the lava dome on April 28th caused a pyroclastic flow to surge down the flanks. Luckily exclusion zones are still in place from activity over the past few months. The Darwin VAAC said an ash columb exceeds 14,000 ft although satalitte confirmation has not been possible due to cloud coverage. JMA reported that 29 explosions from Showa Crater at Aira Caldera’s Sakurajima volcano ejected tephra as far as 1,300 m during 20-24 April. 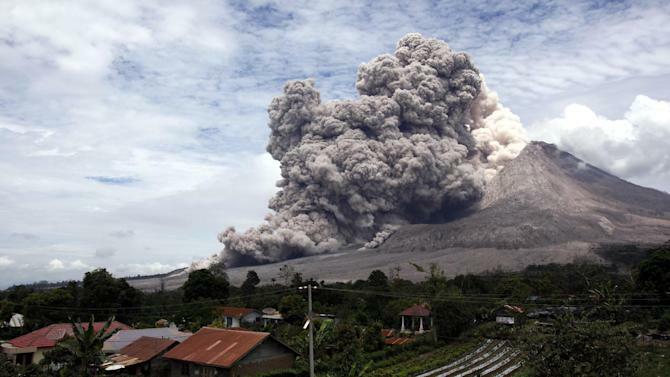 Nine of the explosions generated ash plumes that rose 3 km above the crater rim; one explosion, on 24 April, produced an ash plume that rose 4 km. Incandescence from the crater was visible on one night. The Alert Level remained at 3 (on a scale of 1-5). Based on JMA notices, the Tokyo VAAC reported that explosions during 22-28 April generated plumes which rose to altitudes of 1.5-4.9 km and drifted S, SE, E, NE, and N.
Moderate-to-high seismic activity at Tungurahua during 22-28 April, characterized by long-period events, tremor, and explosions. On 28 April an emission with a minor ash content rose 3 km and drifted W. Roaring was noted and lahars descended the La Pampa (NW) and Rea drainages. During 22-28 April the seismic network at Popocatépetl recorded 25-91 daily emissions mostly consisting of water vapor and gas. Cloud cover sometimes prevented observations of the crater, although gas plumes and nighttime crater incandescence were noted daily. On 22 April an explosion at 01.21 produced diffuse gas and water vapor emissions. Explosions at 16.43 and 17.58 local time generated ash plumes. The Alert Level remained at Yellow, Phase Two. PVMBG reported that during 1 March-21 April diffuse white plumes rose 25-50 m above Anak Krakatau, although foggy weather often prevented observations. Seismicity continued to be dominated by shallow and deep volcanic earthquakes, as well as signals indicating emissions. The Alert Level remained at . During 17-24 April the lava dome extrusion onto Sheveluch’s N flank was accompanied by incandescence, hot block avalanches, and fumerolic activity. A thermal anomaly was detected during 16-18 and 23 April; cloud cover obscured views on the other days. The aviation code remained at Orange. When you think about climate changing eruptions from the last few decades you mind usually automatically jumps to Pinatubo. However there was an eruption which was almost as climate altering just 9 years previous. El Chichón sprang to life in the spring of 1982, with no confirmed eruptions since 1360, many had believed it was extinct. Laying in Southern Mexico between the Trans-Mexican Volcanic Belt and the Central American Volcanic Arc it is actually quite far from any other regularly active volcanoes. Seismicity began to increase in the region around El Chichón from early in 1980 through to the end of 1981 but no extra monitoring or investigation took place as the volcanic complex was not believed to be a threat. This was proved wrong however on the 28th of March seismicity increased dramatically although locals failed to realise they were experience volcanic tremors not the earthquakes often felt in the region. At 23.22 that night an eruption has decimated the lava dome which had grown in VEI 5 Plinian eruption. This initial eruption only lasted a few hours but flung nearly half a cubic kilometer of dense rock at a terrifying rate. The area was quickly and erratically evacuated but as things settled down over the next few days, with only small vulcain or phreatic episodes near the main vent, people began to return home. However El Chichón was far from finished clearing his throat and on Sunday April 4th a much larger eruption begun. It began with a huge pyroclastic flow which surged down the flanks at speeds in excess of 100 km p/h. The village of Francisco Leon was completely buried killing about 1000 people. A further two Plinian eruptions occurred later in the day causing an ash column towering over the landscape at over 29km high. By the time things really calmed down roughly 2000 people had lost their lives and 9 villages had been devastated. The new crater spanned a kilometer wide and 300 meters deep, this has since filled with water creating a highly acidic crater lake as seen below. The area around the complex was predominantly agricultural land and with over 24,000 square kilometers were covered in thick ash, many crop plantations were completely lost, making this Mexico’s most costly natural disaster of recent history. It was not just Mexico however that felt the effects of the explosions. Seriously high levels of sulphur dioxide and other volatiles were sent in to the atmosphere. This coincided with the strongest El Niño phase recorded which lead to some suggesting it was caused by the eruption, however no scientific link was ever made. The combination of the two saw dramatic effects on climate world-wide. El Chichon was a huge wake up call around the globe, showing us that we need to pay closer attention to signs our planet give us, no matter what our preconceptions. Ignorance that a volcano has not be active for a few hundred year lead to seismic warnings being ignored which in turn lead to the loss of lives. It also shows that for all our worry about climate change and anthropogenic emissions, the Earth actually has the upper hand regardless of our efforts; one simple eruption at the right latitude can effect the world’s climate for years and there is little we can do about it…..